No, this isn't a new movie starring Jon Favreau, or a CNN special with Anthony Bourdain, or a new restaurant in downtown Greensboro. This was one of the most fun and memorable evenings I've had at someone's house - the News & Record's John Batchelor to be precise. My dear friend invited me to join him and a few other folks for a seafood feast at his home, with Nasi Kajana, co-owner of Fortuna Enterprises LLC (among many other things). The presentations, demonstrations, food and wine were spectacular. I wish every Saturday night could be like this. Italian Reds and fresh seafood were the star of the show (literally everything we ate and drank). I'm not very well-versed in Italian Reds but each one was more delicious than the last, especially the 2011 Bacca Barolo. Our first course was absolutely stunning. 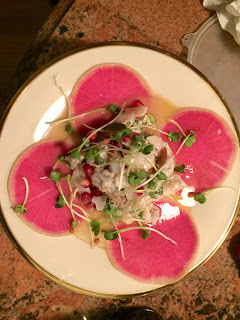 Vibrant bright pink slices of watermelon radish looked like enormous flower petals and served as a bed for shrimp ceviche. I will dream about this dish for a long time. The shrimp was tender and boasted notes of lemon and just a touch of heat. Cherry tomatoes were also present, but my favorite part was the pop of pomegranate seeds. Radish sprouts garnished the dish. I ended up eating the watermelon radishes tortillas, making mini tacos. This dish screamed springtime and would give any restaurant a run for its money. Plating the beautiful first course! Course #2 was a whimsical spin on shish kabobs, with a rosemary sprig serving as the skewer. 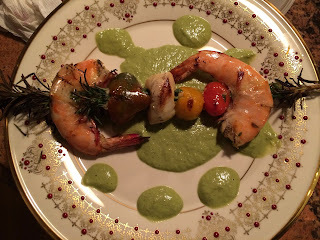 Gorgeous shrimp, scallops and cherry tomatoes absorbed that herbaceous rosemary flavor. A fresh, creamy pesto was a wonderful compliment to the shrimp. It was so smooth and more like a sauce than the traditional pesto I try to make at home. Another dish contributing to my spring fever. 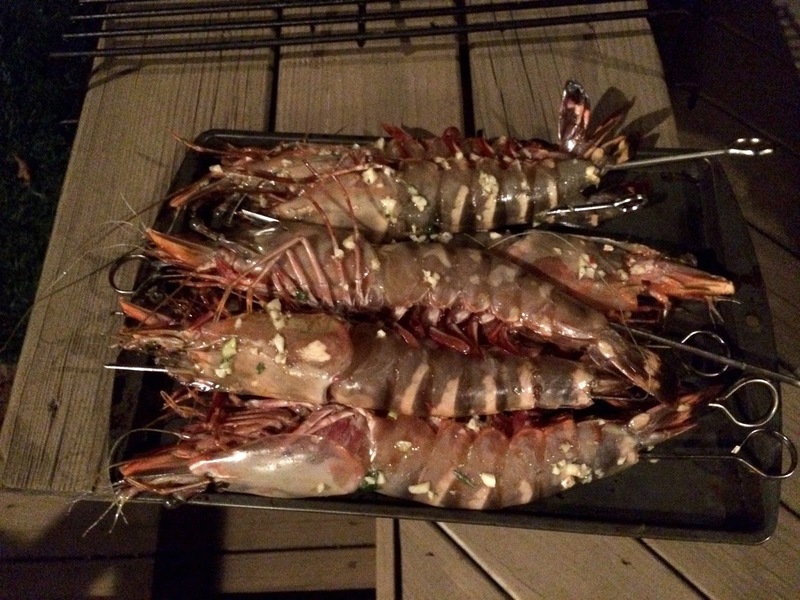 Tiger prawns are a cross between a shrimp and a lobster. I've never seen anything like them in my life. 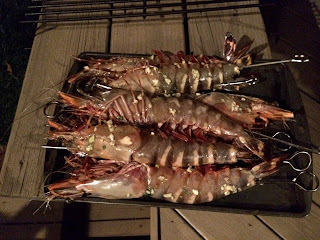 They were about a foot long (not exaggerating) and Nasi coated them with olive oil and garlic before smoking them with 125-year-old wood, pine needles, pine cones and rosemary. This was such a wild thing to watch - he got the wood burning, then added the other aromatics, creating a really unique fragrance. After getting some great smoke going, he let the prawns cook for about 10 minutes. Then he torched them to ensure they were done cooking. The texture was exactly how you'd imagine a shrimp-lobster hybrid would be - it was creamy, buttery and sensational. I would have eaten four more. 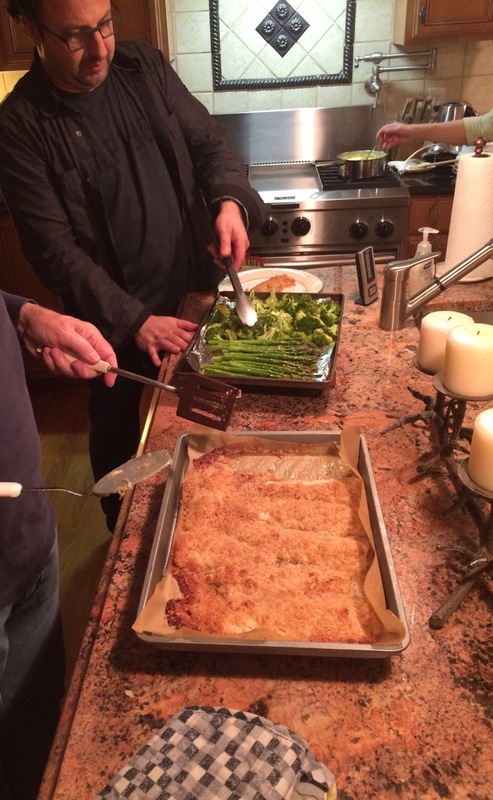 To round out the seafood feast, John treated us to an oven-roasted flounder, coated in Parmesan cheese, breadcrumbs and lemon. The fish melted in your mouth, and the salty bite from the Parmesan crust was addictive. Bright green, oven-roasted broccoli and asparagus made us feel less guilty for indulging in the thick, creamy grits (more like polenta) made by his lovely wife. I was full from the first three courses, but couldn't resist eating every bite on this plate. This was such a delightful evening with wonderful company and delicious food. Every bite was perfect. It's also an inspiration that you can make some pretty fantastic seafood at home - and even more fantastic if you have a grill, 125-year-old-wood and a blowtorch. I will remember this evening for a long time.